Universal Pictures’ Jurassic World: Fallen Kingdom is still at the top of the food chain, bringing in an estimated $60 million for its second weekend at the domestic box office. Stateside the film now sits at $264.8 million, while its international total has risen to $667.6 million. Worldwide, Jurassic World: Fallen Kingdom has brought in $932.4 million. 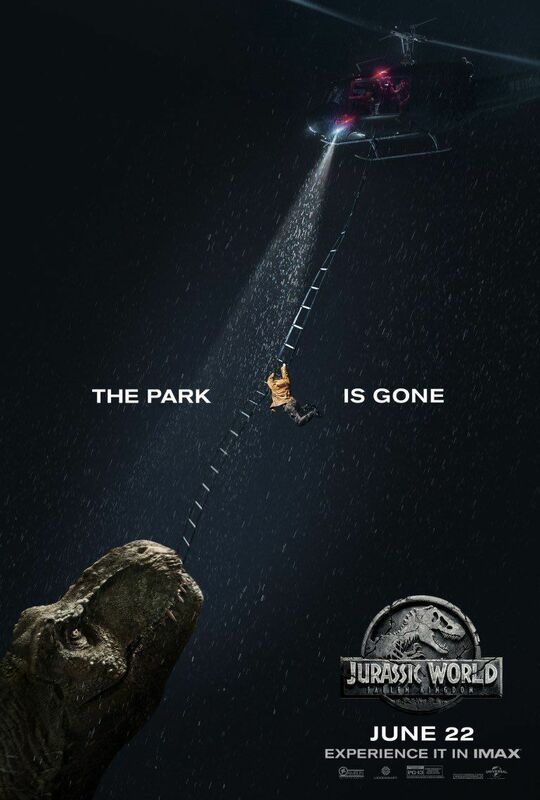 The sequel is still well behind 2015’s Jurassic World which finished its theatrical run with $652 million domestically and $1.67 billion worldwide. Directed by J.A. Bayona, the film stars Chris Pratt, Bryce Dallas Howard, James Cromwell, Ted Levine, Justice Smith, Geraldine Chaplin, Daniella Pineda, Toby Jones, Rafe Spall and Isabella Sermon, with BD Wong and Jeff Goldblum. Disney•Pixar‘s Incredibles 2 fell by 43% in its third weekend, bringing in an additional $45.5 million and crossing the $400 million mark at the domestic box office, making it the third biggest animated release of all time (as its about to pass Shrek 2‘s $441 million total) and Disney & Pixar’s second biggest animated release ever behind Finding Dory. Internationally, the film brought in an additional $44.3 million, bringing its international total to $207.1 million and giving it a global total of $646.8 million. Written and directed by Brad Bird, the film features the voices of Holly Hunter, Craig T. Nelson, Sarah Vowell, Huck Milner, Samuel L. Jackson, Brad Bird, Bob Odenkirk, Catherine Keener, Jonathan Banks, Sophia Bush, and Isabella Rossellini. Debuting in third place was Sony’s Sicario: Day of the Soldado which brought in an estimated $19 million, up from the first film’s opening of $12.1 million. The first Sicario debuted in limited release but after opening wide it finished its domestic run with $46.8 million. Starring Benicio Del Toro, Josh Brolin, Isabela Moner, Jeffrey Donovan, Manuel Garcia-Rulfo, and Catherine Keener, the film is directed by Stefano Sollima and written by Taylor Sheridan. Opening in fourth place this weekend is Lionsgate’s comedy Uncle Drew (released through the Summit Entertainment film label) which opened to an estimated $15.5 million. The film also managed to nab an A CinemaScore. In the film NBA All-Star Kyrie Irving stars as Uncle Drew with an ensemble cast that includes Lil Rel Howery, Shaquille O’Neal, Chris Webber, Reggie Miller, Nate Robinson, Lisa Leslie, Erica Ash, with Tiffany Haddish, and Nick Kroll. Uncle Drew was directed by Charles Stone III, written by Jay Longino and produced by Marty Bowen and Wyck Godfrey. Warner Bros. Pictures‘ Ocean’s 8 fell to fifth place with $8 million, bringing the spin-off to a domestic total of $114.7 million. Internationally the film has brought in an additional $13.8 million this weekend, giving it a global tally of $209.7 million. Directed by Gary Ross, the movie stars Sandra Bullock and Cate Blanchett plus Rihanna, Mindy Kaling, Awkwafina, Helena Bonham Carter, Anne Hathaway, Sarah Paulson and James Corden. The New Line Cinema comedy Tag, fell to sixth place, bringing in $5.6 million and giving it a domestic total of $40.88 million. The adult-oriented comedy was directed by Jeff Tomsic and stars Ed Helms, Jake Johnson, Annabelle Wallis, Hannibal Buress, Isla Fisher, Rashida Jones, Leslie Bibb, Jon Hamm, and Jeremy Renner. The post Jurassic World: Fallen Kingdom Remains #1 with $60 Million Haul appeared first on ComingSoon.net.